We are excited to announce our only Live Music event of the year! Join us Wednesday, September 27th in Healdsburg at Sonoma Cider for an evening with our favorite from the Pacific Northwest. 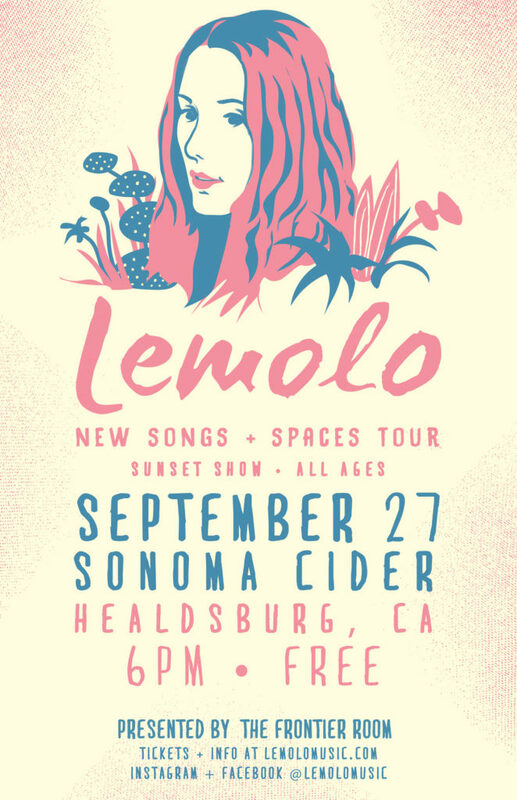 We couldn’t be more excited to share Lemolo’s music with our Sonoma County friends and family! Lemolo is the Seattle dream-pop band fronted by songwriter and musician Meagan Grandall. Grandall formed Lemolo in 2009, inspired by her hometown neighborhood of Lemolo Shore and the quiet beauty of the Pacific Northwest. With help from drummer Adrian Centoni, the band has since been named one of the “Best Seattle Bands” by Seattle Magazine, was voted “Best New Band” by City Arts Magazine, and was just named one of the “Top Bands Rocking Seattle” by Seattle Magazine. Lemolo has released multiple albums independently, and has performed continual sold out shows in Seattle and tours throughout the US and Europe. Join Lemolo on their “New Songs and Spaces Tour”, as they debut new songs that will be on their forthcoming album in intimate and unique listening spaces. This will be a special show that you won’t want to miss!